It is easy to doubt that next-generation fibre-optic broadband would show up in Alabama, one of the most conservative of the states in the USA. But Huntsville, a city with 180,000 people, has taken the challenge. This is because Huntsville has been found to be the best educated metropolitan area in Alabama and has been known as “Rocket City” due to the US Missile Command and NASA setting up shop there, thus leading to an increase in the number of engineers in that city. 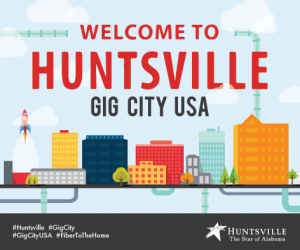 The local government in Huntsville have, with the co-operation of Huntsville Utilities are laying down fibre-optic infrastructure as part of establishing a 21st-century smart power grid in that city. But they facilitated Google setting up their Google Fiber next-generation FTTP broadband service by leasing the infrastructure to Google Fiber. Tommy Battle, the Mayor of Huntsville and Jay Stowe, the CEO of Huntsville Utilities has put his weight behind this effort. As well, the arrival of Google Fiber in Huntsville would strengthen that city’s credibility as a tech centre especially where a lot of research data is being exchanged. If Google were to set up their Google Fiber next-generation broadband network, they either would have to create their own network, purchase an existing fibre-optic network like a “dark-fibre” network or lease bandwidth on an operational network. By leasing the network from Huntsville Utilities, they would be foregoing the control they have over the infrastructure but would be saving on the start-up time and capital expenditure for establishing or increasing their footprint. Hut Huntsville could explore the feasibility of allowing multiple competing ISPs and telcos to operate on this same infrastructure to open the path for increased service-level competition in that city. This is similar to what is being undertaken in a lot of Europe and Oceania where multiple operators are able to rent space on the same infrastructure. It also is a way to prove to other US cities and states that municipal-owned or state-owned infrastructure that competes with the established “Baby-Bell” telco or cable-TV company isn’t necessarily a waste of taxpayers’ money as Comcast and AT&T would like us to believe. Rather the government can, through a separate entity, lease the infrastructure to competing operators and milk money from this leasing effort. As well, this can be a chance for the communications industry to investigate the possibility of European-style service competition where competing services rent space on the same infrastructure and infrastructure owners can compete with each other when it comes to offering service to ISPs or enterprises.